This chart begins with the assumption that the subway already has a demand of 31,200 passengers/hour but a capacity of only about 28,000. In fact the service currently operated provides less than this because the TTC rarely achieves the scheduled number of trains/hour through the peak point at Bloor-Yonge. 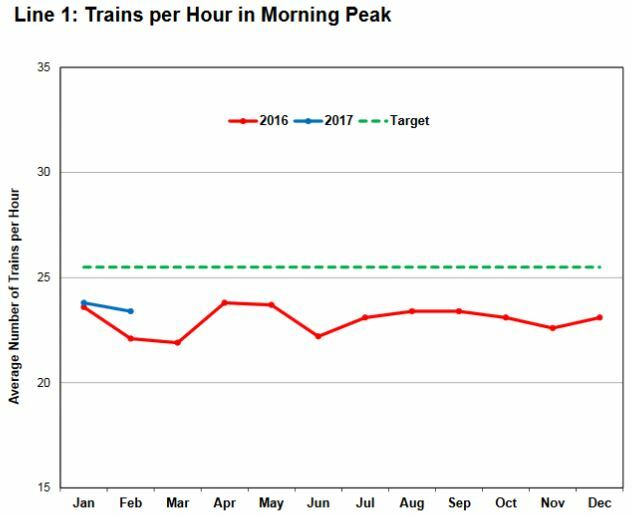 With the introduction of Automatic Train Control (ATC), the TTC hopes to get the scheduled time between trains (headway) down from 2’21” to 1’50”, a 28% increase, taking the line’s peak capacity up to about 36,000. Whether the TTC could actually achieve this remains to be seen. 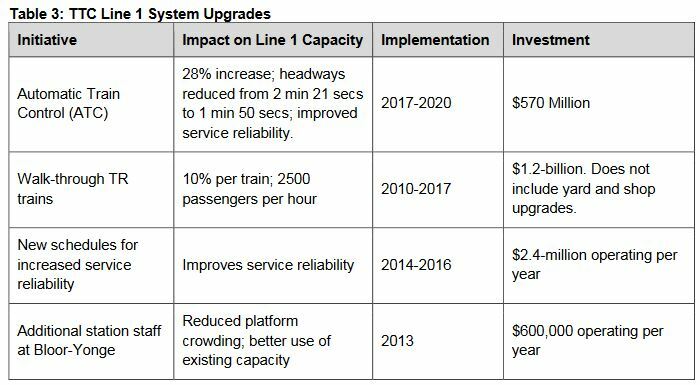 The City Manager’s report lists various capacity improvements for Line 1. This table looks good, but three of the four changes have already been implemented and do not represent future potential improvements. A related problem is planning for the fleet and carhouse. Although the TTC plans to add some trains to the YUS once ATC is available, they do not have enough spare equipment to add 28% to the number of trains in service. The actual bump required will probably be a bit less because of ATC efficiencies, but there simply are not enough trains in the Line 1 fleet to operate a 1’50” headway. There is no provision in the future budget for acquiring either the vehicles or the carhouse space to handle the increase, and this would likely have to be bundled with any YSE project (which would need additional trains of its own). There is already provision in the YSE design for an underground storage yard at Richmond Hill. Population growth will push up demand on the YUS even if nothing else happens, and by 2031 it would exceed even the target ATC capacity. 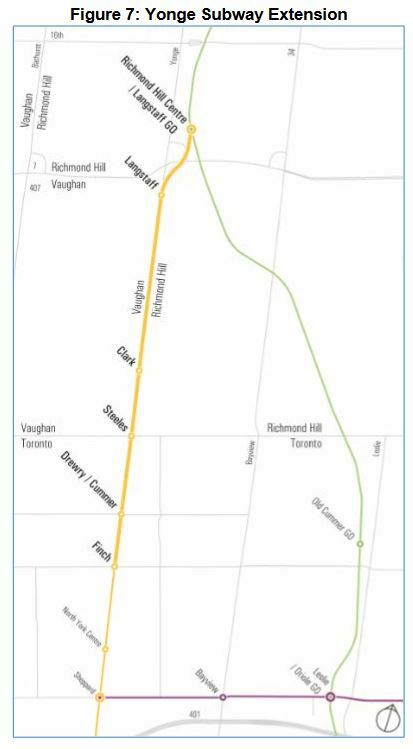 A small diversion of ridership (1,300 per hour) is projected when the TYSSE opens in December 2017, but this benefit to the Yonge line would be instantly backfilled with demand that cannot be handled today. A further offloading (4,200 per hour) is projected when the GO RER services begin in the 2024 timeframe, notably from the Barrie line. This assumes that the fare structure and subway congestion combine to encourage a shift to GO. Adding in the YSE is projected to increase demand by 2,400 per hour. Yes, we are planning to build a subway that will carry even fewer riders than the SSE. Indeed, if it carried many more, the situation on Yonge north of Bloor would be grim. 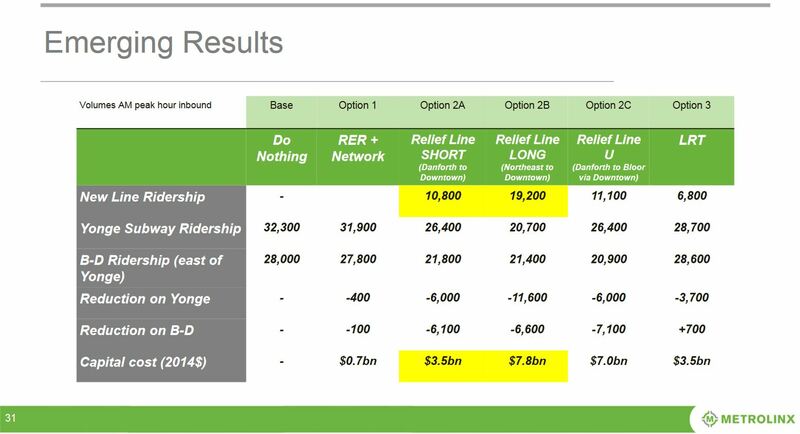 Meanwhile, the benefits of a Relief Line, especially the northern extension to Sheppard, are shown dramatically in the following chart from the Metrolinx study. Ridership on the RL would be considerable, and the effect on demand within the existing network would be quite dramatic. Far too often the high cost of the RL is cited as a reason not to build it, and yet the investment would bear benefits that none of the other options for shifting demand can provide. Notably, elimination of the bottleneck at Bloor-Yonge could avoid a very expensive and complex project to expand platform and circulation space there. 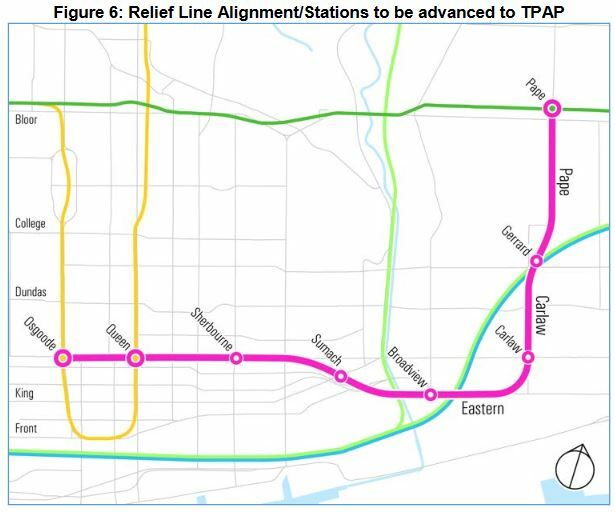 The Relief Line South will reduce demand on Line 1 to a point below capacity, south of Bloor -Yonge station, during the critical morning peak hour in 2031. The Relief Line South diverts a significant number of westbound to southbound transfers between Line 2 and Line 1, which reduces the number of riders at the critical peak point south of Bloor-Yonge station. 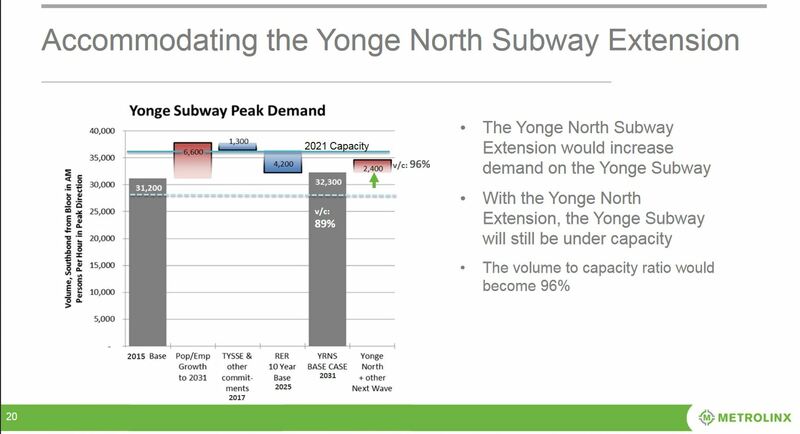 However, the Relief Line South will not mitigate any forecast increase in demand on Line 1 in the peak southbound direction of travel north of Bloor-Yonge station. Consequently, the section of Line 1 immediately north of Bloor-Yonge station becomes the most congested section of Line 1 after the Relief Line South is added to the subway network, with ridership approaching capacity in 2031 (between 34,500 and 36,000). The City Manager’s report recommends that Council approve an alignment for the Relief Line that dodges west from Pape to Carlaw where the rail corridor crosses Gerrard Street. This would be the location of a future SmartTrack and RL station at a location ripe for redevelopment (the Gerrard Square Mall). Whether there actually will be a SmartTrack station at Gerrard remains to be seen as the new stations are coming in rather more expensive than the low cost SmartTrack line was supposed to be. A far more likely joint station is at Broadview in the Unilever/Great Gulf development site now known as East Harbour. Design work is already underway not just for the south end of the line, but for the full Relief Line from Sheppard south to downtown. However, the western piece of the line (to Dundas West) appears to have fallen off of the map, and it would be very hard to justify given competing service in the GO/SmartTrack Weston corridor. City staff propose that a Class 3 estimate (a level sufficient to be reasonably certain that costs are not wildly out of line) would come back to Council for the RL South in late 2019. A separate report in early 2018 would address the business case for the RL north, a preliminary alignment and stations. As an extension of the existing subway, the TTC wishes to retain complete control and ownership even though much of the line would be in York Region, and the City Manager proposes that the entire cost of the extension would be paid by York Region and other senior governments. It is entirely possible that there will be some pushback here given that a small portion of the line is actually inside of Toronto which will benefit from the creation of new stations at Cummer and especially at Steeles. 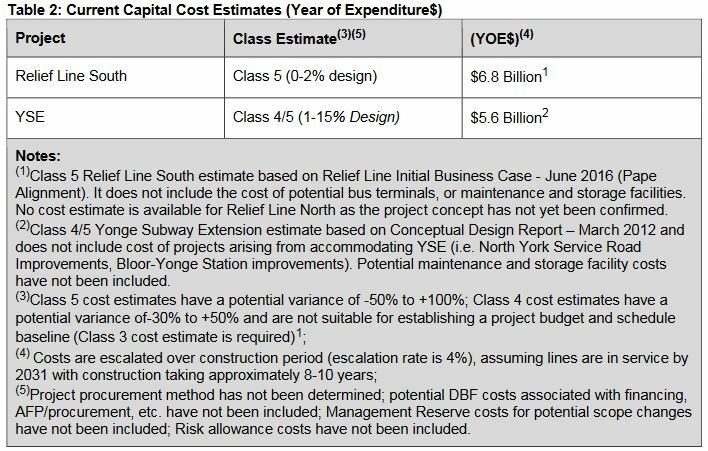 c) report back to the TTC Board and City Council at the next decision gate of the Yonge Subway Extension once a Class 3 cost estimate has been developed for the project, which is anticipated to be in the fourth quarter of 2019. In other words, updated info on both the RL South and the YSE will come back to Council in Fall 2019. By that time we should have a better sense of how the TYSSE’s opening has shifted ridership between the two arms of Line 1, and the TTC should be on the verge of full conversion to ATC with improved service. The projected cost of designing both routes is summarized in the table below. Note that for the Relief Line North, this is only for preliminary work and so the cost is much lower. As for the cost of construction, the estimates below make interesting reading, especially the long list of caveats in footnotes about costs that are not included. Footnote 4 assumes a common target date for opening both lines, 2031. The role of asset owner and operator is still to be confirmed. 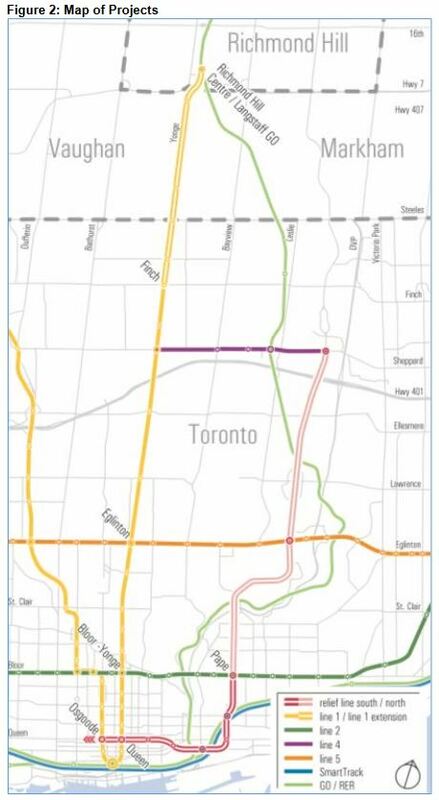 For the purposes of planning, it is assumed that provincial funding for the capital construction of the Relief Line is predicated on Metrolinx ownership of the asset. It is also assumed the TTC will be the operator of the Relief Line. This implies a delivery model more like that used for the Crosstown LRT project rather than an expansion of the TTC subway network. Indeed, this arrangement leaves open the question of technology for the RL, even though the TTC has been planning on the basis of an integrated operation (shared maintenance) with the existing subway. While the idea of provincial ownership has been used as an accounting scheme by Queen’s Park (owning the asset offsets the debt to build it on their books), it is unclear what would happen for a line with joint funding from all governments. This wording suggests that there is some wishful thinking going on here that Queen’s Park would pay 100% toward the RL’s cost, a rather optimistic premise. If Mayor Tory can stop stamping his feet like a spoiled brat and let the City Manager’s proposal go forward, there will be a great deal more information obtained about both the YSE and RL projects including how the two of them will interact with the wider transit network. Even the Deputy Mayor, Denzil Minnan-Wong, who is not exactly a fan of transit spending downtown, was enthusiastic about the prospect of a “Don Mills Subway”, a name by which the RL really should be known. This is an important shift – looking not just at where a line goes, but who it will serve. With elections coming in 2018 both at Queen’s Park and City Hall, it is important to get this work underway so that whoever is in power will receive the detailed information needed for any decision in 2019. This entry was posted in Beyond 416, Downtown Relief Line, Subways, Transit, Yonge Subway Extension, York Region. Bookmark the permalink. Robert Wightman – yes but later, when it is an operating insanity, and a self-evident white elephant, I will have the comfort of knowing I expressed my opposition. The issue today here among many places, is that emotional logic has replaced logic, and the notion of fair has lost the balance of across many things, and come down to the 3 year old version, where fair is evaluated entirely based on the narrow thing we are talking about now. So that York has more roads, more backyards, creating more expensive services by choice, does not factor in, The total costs of service provision, per resident, and how they chose those costs is not permitted. Sorry, but having to clear and maintain 300 lane meters per household, vs 50, is a choice of the people in question, and these costs should reduce other services, or increase the costs of their taxes. Fortunately I live in Brampton which is not as wealthy as York, so we do not have such extravagances. Also I believe that our transit system which has BRT lite, ZUM, may not have all the fancy infrastructure that York does, but I do believe that it has a much better transit system that actually serves its clientele. And we are not demanding our own subway, just all day 2 way GO service. Robert Wightman – which is also what makes sense for York. If they really want to perfect their transit, and create density – they need to start with actually changing the zoning for parking, and providing dense service in the corridors they are actually building. There is a severe logical inconsistency within the argument here. Most people move to the suburbs to get away from density, but suburbs are structuring themselves in a way that they will become denser then the regions they are competing with. So if suburbs lose their core source of competitive advantage, without being able to provide the same institutions and amenities as a traditional downtown core why would anyone move there? We are not talking about creating the same built form but real density, not miles of pavement. Note the Places To Grow Act has committed the province to avoiding increased sprawl, while creating space to expand. Well, when you require parking in large amounts, you do not creating living space, nor do you test what people want. Saying you must have 2+ spaces per residence means that people are paying for something they may or may not be otherwise willing to pay for. When you require 1 parking space per use, you are creating a large parking lot in front of all retail and commercial space, whether it is used and there are people who would be willing to pay for it or not. The reality is, if you want space, green, and to avoid massive sprawl, you need to get people to choose to pay for the parking they want, not mandate as much as they might ever want. I would also note, having the space, perforce encourages additional cars and driving. Note one of the reasons that people do not like to walk is crossing the extra distances created by large parking areas. This also makes transit service order of magnitude harder. The idea behind Places To Grow was to create higher intensity, so that we we destroy less of the environment. It is a stated public policy goal that is destroyed by government policy with regards to mandated parking space required by regulation. Malcolm N says We are not talking about creating the same built form but real density, not miles of pavement. Note the Places To Grow Act has committed the province to avoiding increased sprawl, while creating space to expand. The severe flaw in this argument is not its principles but its application. First, as you probably know, public transit is economically defined as an inferior good so that the wealthier people become the less of it they want. So as you build density in suburbs, assuming that the goal is not to manufacture poverty, there will be a natural propensity for people to take the automobile whether there is road space or not. Second, an important source of economic competitive advantage for the region is having a flexible labour force, that is to say people must be able to move from job to job with ease. In a region with dispersed office growth creating a transit system to satisfy these travel demands in a competitive fashion is prohibitively expensive and highly unlikely. Third, considering the above issues, building density in regions whose communities were predicated on substantially different build forms overloads the infrastructure these communities are highly dependent on and substantially lowers their quality of life. The result is lower economic competitiveness, lower quality of life, and increased political volatility. It is time to rethink the critically flawed Places To Grow Act. If people are really moving to the suburbs to get away from density, and the planning system is geared to supply this, then those people are going to be out of luck on amenities. Or pay through the nose for them. York Region wants the subway not because it’s faster than the GO train, but because it’s cheaper than the GO train. 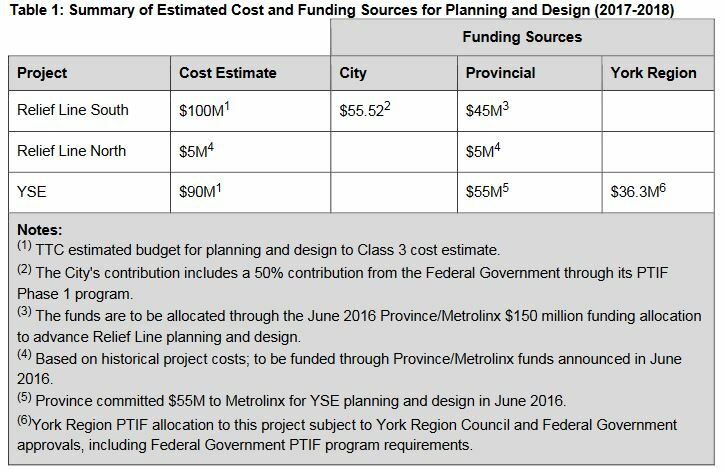 But as both ridership analysis and financial analysis shows, the subway is going to be underutilized and will cost Toronto, not York Region, taxpayers every year to cover the operating deficits. Of course, from the point of York Regionites, what’s not to like? In the matter of repealing Places to Grow to allow sprawl to the further edges of southern Ontario, nope, forget it. Want to live in low density? Move to Saskatchewan. There are plenty of small towns that are losing population. Houses are cheap, density is low. I like Radisson. Ed says: In the matter of repealing Places to Grow to allow sprawl to the further edges of southern Ontario, nope, forget it. The issues with Places to Grow are not those of principles but those of application. The Act should not be repealed, but updated so that the principles are better applied in a more effective and efficient manner, in a way that better aligns the Act with the underlying economic, social and political dynamics that define what is possible in the region. The issue with asserting that transit being less desirable is based on a built form that is required by statute, not market forces.